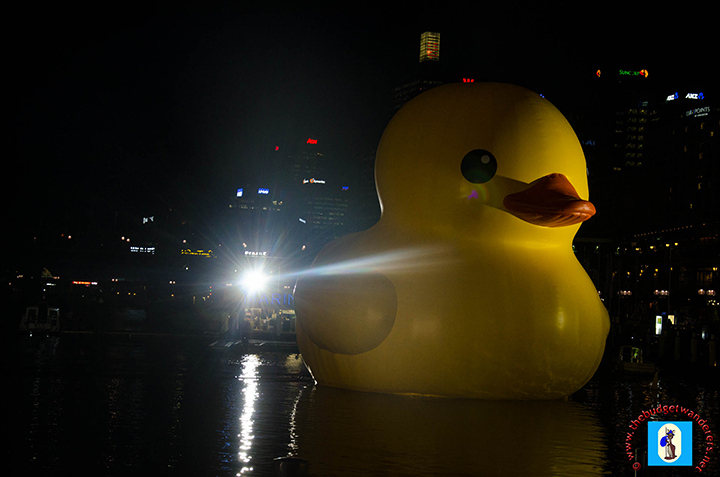 One of our best photos of the Rubber Duck. After a day at work, The Budget Wanderers met with one of our couple friends from Melbourne whose visiting Sydney for the first time. Although, they only have two days and a night in Sydney, we volunteered to bring them around in Darling Harbour as we wanted to show them how picturesque the seaside was. 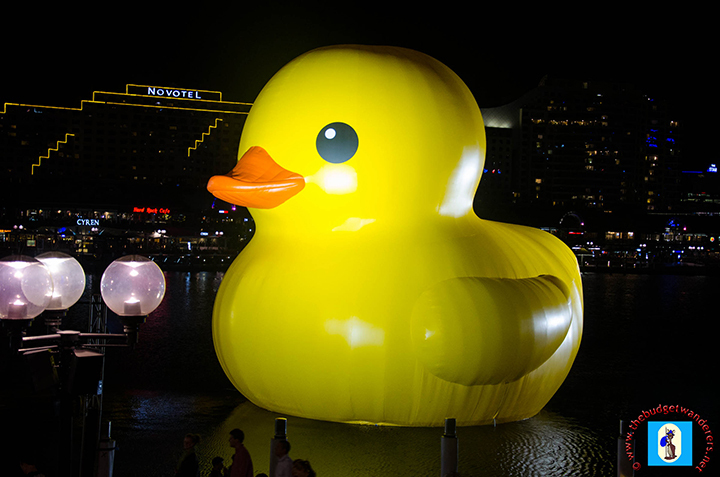 Besides Sydney Festival 2013 is currently running, and we wanted to give them a glimpse of the Rubber Duck at Cockle Bay. Dancing Brolgas seen at night at the Cockle Bay Wharf. It was dusk when we arrived at Darling Harbour, all four of us, we took photos of us together as we tried to capture the funny side of each and every one of us. We exchange stories and fun memories as we walk through the pathway along the harbour. And just as we arrived near the Rubber Duck afloat at the bay, we took turns in taking candid photos, playing like toddlers for the first time in a tub. It was the funniest night I could ever imagine as we were goofing at the Rubber Duck, that even bystanders and other people were giggling with laughter as they look at us. How free it is to be like a child! Innocent and free-spirited…No glimpse of sadness and worries, just smiles and laughter! 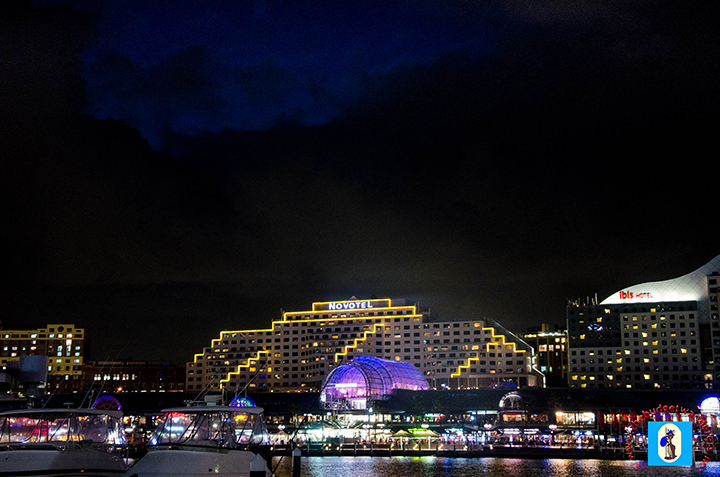 As the darkness surrounds Darling Harbour, Sean started to capture the glittering, colourful lights that enveloped the whole marina. The sparkling lights that come from various buildings around the harbour makes the whole night more special. Our friends were smitten with the grandeur of the Harbour and returned the following day to experience more the attractions that were located in the area. 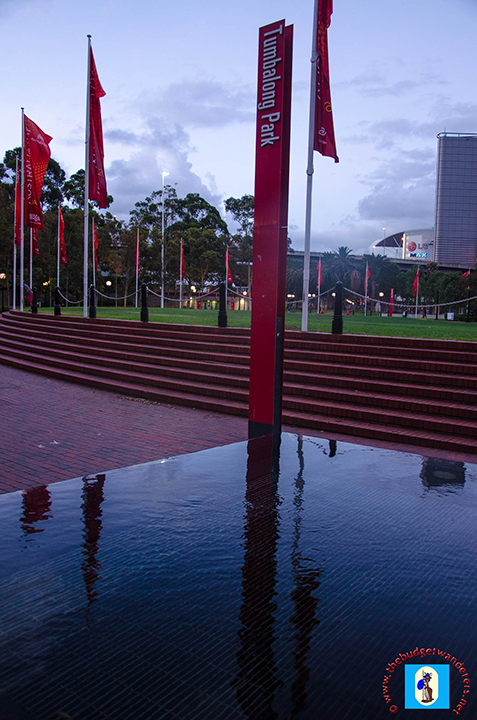 The night at Darling Harbour was picture-perfect. The shimmering surrounding of the marina was more memorable because it was a night of fun with old friends, building once more a solid bond that all of us will cherish. And as we walk home, the smiles on our face were evident even when we woke up the following day for another day of work. The night at the harbour rejuvenated our souls as we thread the stressful week of work, providing the lighter side of life. Its beauty made the whole night spectacular, and gave the whole week a breather. 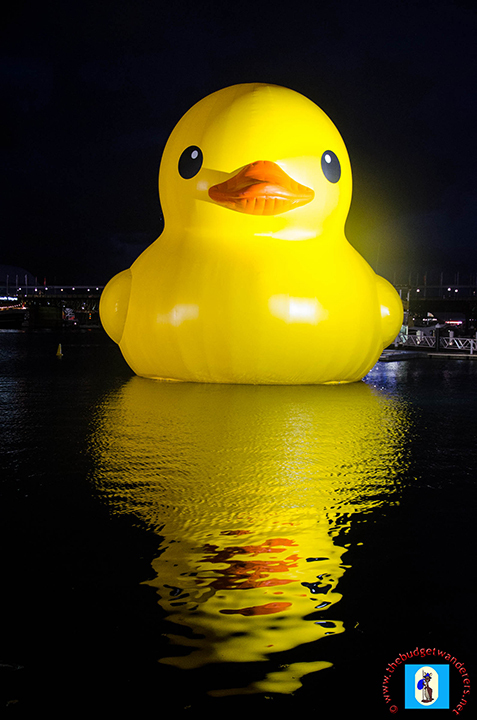 Very nice photos of the harbour, especially the Rubber Duckie and its reflection. Stunning! I have seen Darling Harbour before but not during the night. It is just full of life. 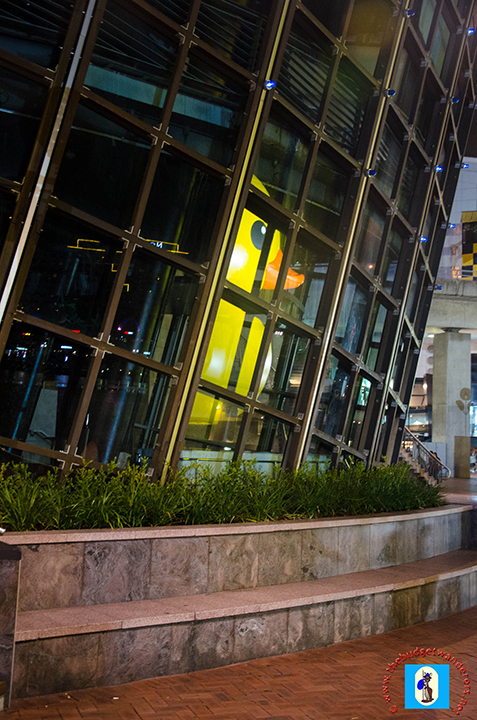 You’re photos are exceptional, especially the duck reflection on the glass of the building. Great Shot! 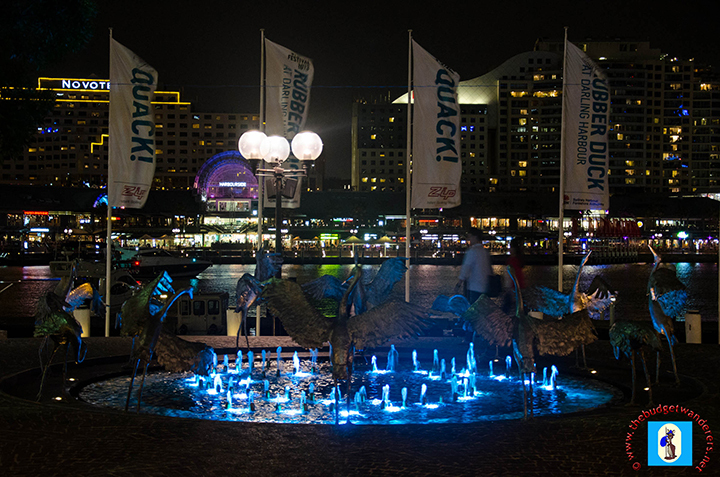 My family went there last week in the afternoon and the Rubber Duckie is just awesome at Darling Harbour. This photos of yours at night are very pretty.